Bedroom one on the first floor has two single beds which can be pushed together. Bedroom two has a double bed and is on the ground floor. Bedrooms are equipped with bedside tables, chest of drawers and clothes hanging space . Top Quality Egyptian cotton linen is provided as are towels. Ground floor WC en-suite to bedroom two, and first floor shower room with WC. Modern, quality kitchen equipped with an oven and hob, microwave, dishwasher, washing machine and fridge freezer. The open plan living area is equipped with 2 comfortable sofas, flat screen TV and a coffee table. Guest WiFi is available throughout the cottage. 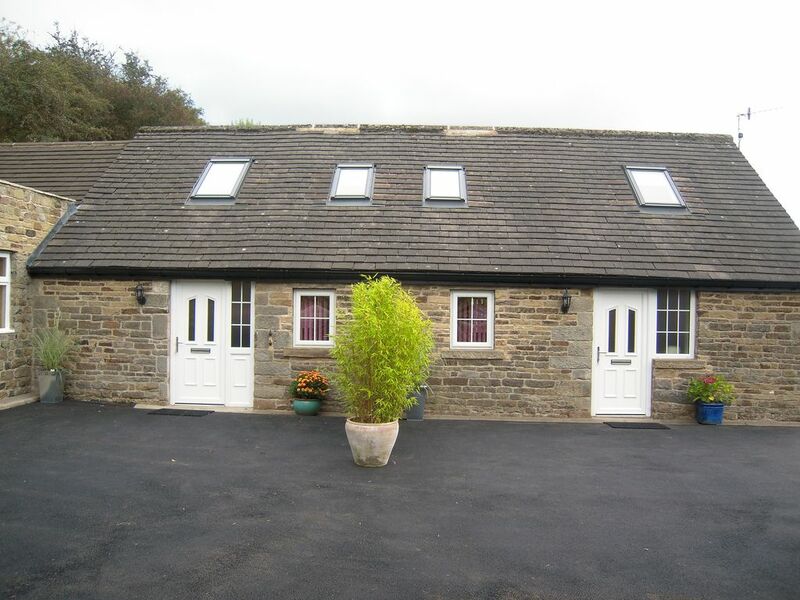 Attractive well appointed refurbished stone Cottages in Hathersage. A short walk into the village to reach all the local ameneties. Rural walks and cycling for all abilities from the door. Adjacent parking for guests vehicles with large utility/drying room for outdoor sports gear. Secure storage for sports equipment available onsite. Can be booked with the cottage next door to accomodate larger parties. Oil fired central heating, controlled by thermostatic radiator valves. Secured guest WiFi is available throughout the cottage. Outdoor seating in fron of the cottage. Secure storage for up to 4 bicycles may be arranged by request. Sickeholme Golf Course is a 2 minute drive away. Notes on accommodation: The cottages are thoroughly cleaned on every changeover. Smoking permitted outside the property only. High Chair and Travel Cot available on request. Sorry no dogs. Outside: Plenty of parking, a seating area and a boiler/utility room ideal for drying muddy boots and coats. The cottage was a real home from home. It has been very well refurbished and is very comfortable. We visited for a weekend to spend some time with our daughter who is studying at university in Sheffield. It was a great base for visiting the peaks and surrounding areas. Would highly recommend. Excellent location. Really cosy and nice accommodation. Lovely cottage, clean and very well equipped. We stayed when the weather was quite warm but there were fans in both bedrooms. The owners were friendly and helpful. The cottage is in a good location for easy access to cycling, climbing, caves and lots of pubs and restaurants nearby, one star missing as the road was quite noisy when the windows were open. Thank you for an enjoyable stay. The place is perfect and is bigger than it looks. Walking distance to town (5 minutes) and the best hike in the Peaks starts right in town to Stanage Edge where there are amazing views of the Peak district. The cottage is very modern, clean and of high standard. In fact we are thinking of going back again before we leave to go back to the USA in August. We stayed at the Hillfoot Farm over the Early May Bank Holiday and we had the best time here. Helen and Andy helped us with any queries we had, were very welcoming and made sure everything was ready for our arrival. The place is clean and cozy, in very good condition, warm if required, has a fully equipped kitchen and the bed was very comfortable, a thing we greatly appreciated after a long day of hiking. Also, Hillfoot Farm is located close to the village centre, so we didn't need to drive to get to the shops. The entire experience was great, and we've enjoyed every minute of our stay in this lovely place. We'd recommend this place to anyone! Peak District Outdoor Activities including Walking, Mountain Biking, Climbing, Cycling, Caving, Pot Holing, Fishing and Hang Gliding to name but a few. The Bus service provides good links to Sheffield,the nearby town of Bakewell, Chatsworth House, Buxton and Castleton. Hathersage railway station is on the main line between Sheffield and Manchester with regular trains providing easy access to both city centre shops, and Meadowhall indoor shopping centre. The railway also offers direct access to Manchester Airport. Ideally located for visiting Sheffield and Manchester Universities. The beautiful village of Hathersage is a 15 minute walk or 2 minute car ride away. Nearby are the stately Homes of Chatsworth House and Haddon Hall and the market towns of Bakewell, Matlock, Buxton and Castleton. The Village of Hathersage offeres many local amenities including pubs, restaurants, cafes, shops, post office, a children's play area and skate park and in the summer months a heated outdoor swimming pool. Booking Notes: Secure online payment available, which includes guest payment protection. Changeover Day: Days and times flexible by arrangement. Check in from 4.00pm Check out by 10:00am Notes on prices: Discounted rates available for weekly and monthly stays.